I don't suppose any of you will admit to being a Batman or Superman or Spiderman, etc. fan as a youngster (let alone now); but you may recall that they all had something in common - there was some major event or trauma that occurred in their lives that caused them to pursue that calling. As facility managers, CFOs, or business owners most of you are called upon to perform superhuman tasks on a daily basis. I know you have risen to the task without the trauma of some planet exploding or being bitten by a radioactive spider. Energy Consultants Inc.‘s approach to managing your utility consumption and costs can give you another opportunity to be a hero with out the trials of stopping a mad scientist from taking over the universe. Some of you have implemented energy saving strategies in your facilities and I encourage you to bravely venture forth into additional areas. 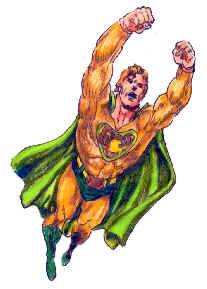 Our Superhero, ECIman gets his power from years of utility and energy experience, and now fights the never-ending battle against energy waste and pollution and stands for the American Way, liberty, apple pie, motherhood, etc.